One of my favorite spiritual insights is that healing—real healing—looks more like the lancing of an infected boil than the shooting of a magic bullet. A missionary friend of mine likes to joke that most of us prefer to think of God as a magic unicorn who fires rainbow colored darts from his enchanted wand—when in reality God is more like a skilled surgeon coming at us with the sharpest of knives. Of course, I fully realize that we are speaking in limping analogies here, but how else can we talk about God other than symbols and stories? When I was a kid, my cousin Melanie and I made the genius decision to sneak off together to ride the family’s red Honda 90 motorbike to the beach near our summer camp. We planned to jump the sand dunes, just like our skilled, cycle-riding brothers regularly did. Being amateurs in motor sports, we opened up the gas full throttle at the sand dune, causing the bike to flip in the air and land right on top of us. The scalding hot exhaust pipe left a third-degree burn on poor Mel’s leg—which she proceeded to hide under her jeans for the next two weeks so we wouldn’t get into trouble. Needless to say, by the time her mother discovered the burn it was badly infected—with Mel limping severely and practically in shock from the wound. It would take a deep cleaning plus weeks of hard medicine to heal the injury, which could have been dealt with much more effectively had we only been forthcoming about our misdeed instead of hiding it. How often do we find ourselves hiding our sins and infections from God, instead of just coming clean about our inner maladies? We posture and pretend, using all of our energy to cover our abscesses, instead of bringing them into the glaring light of day. We hide our misery to the point of madness, instead of admitting that we are sick patients in need of significant soul-curing remedies. Somehow, we keep believing in magic instead of mercy, wanting the wand treatment instead of God’s penetrating love, which cuts through and exposes our deepest disorders. Part of the problem today, as I see it, is that we’ve grown collectively dishonest, all corroborating in creating the current climate of corruption. We point our fingers at “them” and “their” faults, without admitting that “they” represent “us.” You spot it, you got it, is another way of naming this reality, and what we’ve spotted surreptitiously via scrubbed servers and secretly hidden cameras has indicted every single one of us. When rampant corruption, greed, powermongering, pomposity, and disrespect for the human person become the hallmarks of our leaders, then “Mea culpa!” must be our communal contrition cry. May the message of mercy reach everyone, and may no one be indifferent to the call to experience mercy. I direct this invitation to conversion even more fervently to those whose behavior distances them from the grace of God…For their own good, I beg them to change their lives. The wound has been exposed, the boil lanced, and the medicine of mercy has been offered. Maybe the Year of Mercy has served its healing purpose after all. The poignant, personal statement by Justice Ruth Bader Ginsburg about the death of Antonin Scalia, and the ensuing details of their warm friendship, has brought to mind the close relationship I enjoy with my some of my own family members who serve in the political arena—loved ones with whom I have deep differences over the issue of abortion. My teeth were cut on the campaign trail, as I grew up in a highly political family of Louisiana Democrats, wherein one or more of my immediate relatives have held public office almost continuously since I was born in 1960. Memories of my childhood are replete with door-to-door canvassing, rallies and working long hours alongside my siblings and cousins in various campaign headquarters in New Orleans. There we answered phones, ran endless copies of flyers on Xerox machines and addressed, stamped, and sealed envelopes until our fingers were raw. At rallies, we handed out yard signs and bumper stickers, blew up hundreds of colored balloons with helium and sang homespun songs for our candidates. Politics, and its inherent idealism of making the world a better place, was at the center of our lives. 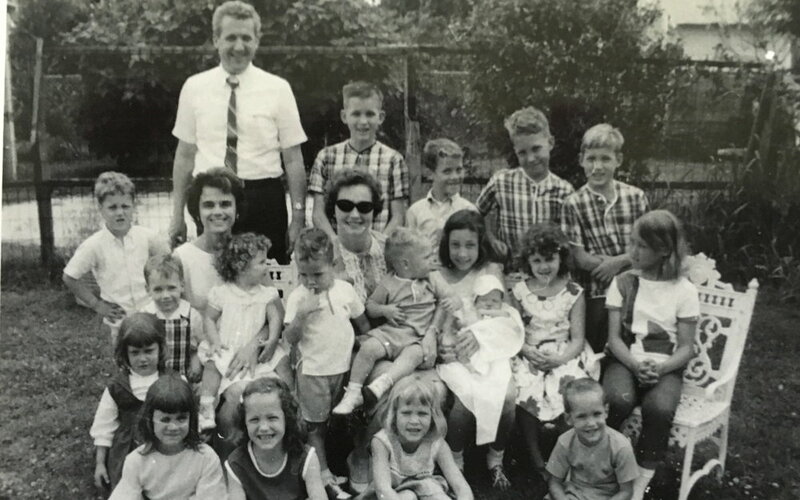 Our boisterous Catholic clan was extremely family oriented, with two lone brothers spawning nineteen children in less than a dozen years—my parents’ 10 and Uncle Moon and Aunt Verna’s nine. (We won the race because we got a set of twins:) Sundays included shared lunches at Grandma’s house after church, where we lingered to play jacks, card games and jump rope over the dueling smells of Paw Paw’s sweet pipe and Uncle Moon’s strong cigar. I adore the smell of pipes and cigars to this day, as both instantly transport me back to memories of family gatherings over Grandma’s rump roast and gravy. Summers brought us all together at the rustic camp that Grandma bought on Lake Pontchartrain in 1963, where swimming, fishing, boating, skiing and crabbing kept us, and many of our friends, entertained from dawn until dark in the scorching Southern heat. The pinnacle of summer was our Fourth of July celebration, when we raised the family flag that rested on Paw Paw’s coffin when he died in 1967, then recited the Pledge of Allegiance and read aloud the Preamble of the U.S. Constitution. Uncle Moon’s short speech about appreciating the gifts of freedom and democracy that we enjoy in our great nation preceded the singing of “America the Beautiful.” We were proud to be Americans and Landrieus. Sadly, the winds of change crept in during those precious years, bringing with them drugs, rebellion, a confused post-Vatican II church, contraception, radical feminism, and the new law of the land, abortion on demand. I was swept up into much of the Cultural Revolution, but somehow, by God’s grace, I always knew with certainty that abortion was wrong. Whether it was the Natural Law or the sensus fidei at work, no one ever had to tell me that killing an unborn child in its mother’s womb was a grievous offense. Furthermore, no one had to convince me that a pregnant woman was carrying an actual child, given the fact that I had nine siblings and numerous cousins, with almost half of them younger than I.
Roe v. Wade was decided in 1973, the year I became a teenager. I didn’t think much about the issue of abortion until senior year in high school, when a close friend of mine became pregnant and had an abortion. Suddenly, what had previously been clearly wrong was now a “necessary choice.” Freedom became associated with the ability to choose for oneself, and even the ability to define reality according to one’s own perceptions. Thus began the slippery slope that slid our nation headlong into 60,000,000 aborted babies, with some of my family members ultimately leading the national charge for abortion rights by way of their political power. I’ve prayed, fasted, and grieved hard about my family’s pro-choice stance over the years—the very issue that eventually pushed me into the Republican Party by default. When possible, I’ve tried to persuade those I love to see the light. Some conversations have gone well, others not so much. I imagine that Justice Scalia must have felt real grief over what he saw unfold before his eyes during his long tenure on the Supreme Court—not only because he was a jurist who believed that the Constitution nowhere permitted a woman the right to abort her child, but also because he was a devout Catholic who firmly believed in the sanctity of human life. Even so, he worked side by side and apparently enjoyed intimate friendship with people who assumed a completely different stance than he did on abortion (as well as on marriage and other moral issues). I was genuinely surprised to learn this fact about him but am heartened by his example, especially during this Year of Mercy when Pope Francis is challenging us to re-think the way we go about relationships, especially at a time in history where mercilessness and rancor seem to rule the day. There is a time and a place to stand strong for what we believe, particularly when standing firm for what is right and true affects the direction our future takes, both individually and corporately. But there is also a time and a place to put painful, divisive things aside for the sake of strengthening relationships, for the sake of growing in understanding of one another, for the sake of cultivating friendship. Humility and charity demand that we don’t have to engage the fight every chance we get, don’t have to win every argument or prove we are right all of the time (or even most of the time for that matter). In fact, sometimes we win more through listening, through kindness, through love. That’s one thing that Nino Scalia’s towering legacy is saying to me, and I am taking note. This article was previously published on Aleteia. On this day of prayer, fasting and penance, we sadly remember the 56,000,000 babies who have died through abortion since the legalization of abortion in America in 1973. May God have mercy on us and upon our nation. In short, the mercy of God is not an abstract ideal, but a concrete reality with which he reveals his love as that of a father or a mother, moved to the very depths out of the love for their child. Pope Francis, Miseracordiae Vultus, par. 6. The only desire I had when I boarded the plane was to power down, enjoy some silence, and read Bishop Robert Barron’s Catholicism: A Journey to the Heart of the Faith, newly downloaded to my i-Phone. It had been a very busy weekend of non-stop talking, which included giving two one-hour presentations at a Marian conference. But when a 20ish-looking blonde woman sat next to me, something told me to put down the phone and tune into her. “Where are you coming from?” she asked. Introducing herself as Paige, she shared that she was getting married in May, and that she and her Jewish fiancé had recently traveled to Israel for a month-long visit to attend a friend’s bar mitzvah. She disclosed her horror over the routine violence that is part and parcel of life there, especially as Muslim extremists increasingly engage in random stabbings of Jewish people. We both agreed that the world needs much less hatred and violence, and much more love. Paige shared that her parents had raised her without faith, even though they’d sent her to Catholic schools her whole life. By this time, Paige’s big, beautiful blue eyes were locked into mine. This article was first published at Aleteia. How much I desire that the year to come will be steeped in mercy, so that we can go out to every man and woman, bringing the goodness and tenderness of God! Pope Francis, Misericordiae Vultus, par. 5. Drop by drop; the water fell through the sugar cube into the glass of absinthe perched on the Royal Street bar. Elvis’ “Blue Christmas” blaring from the stage had summoned us in for a dance, just after we’d finished caroling with thousands of others in the shadow of St. Louis Cathedral. My husband, Mark, decided to try the famous New Orleans libation, and as we watched the sugared water slowly sweeten the bitterest of drinks, Leonard approached the bar. “What are you guys doing in New Orleans?” he opened. “I hear God say, ‘You are my beloved daughter,'” I replied, grateful that the voice of Love has finally supplanted the voice of condemnation in my head. Leonard’s eyes widened like saucers and welled with visible tears. “Well, I’ve never heard anything remotely like that in prayer!” he exclaimed. How many people have experienced their human fathers this way? And how many people believe this is who God is? Being in ministries where we hear the personal stories of wounded souls on a daily basis, Mark and I know this number is not negligible. Sadly, there seems to be a consistent theme in too many narratives: physically or emotionally absent fathers, raging fathers, alcoholic fathers, abusive fathers—fathers more like Zeus that the Father whom Jesus Christ came to reveal. Note: This article was first published on Aleteia as "The Mercy Journal." Carried tenderly through the Jubilee Door of Mercy at the Basilica of the Immaculate Conception by her parents, 10-day-old Grace Philomena would be baptized in just a few hours on this same special day—the Feast of the Holy Family in the Octave of Christmas during the Jubilee Year of Mercy. Grace. God’s favor and unmerited gift. A perfect name for a baby conceived in an imperfect situation by unmarried young adults; yet a child welcomed, wanted, loved by God and by us. Moreover, a child soon to be infused with the grace of God, giving her the one identity that truly counts: child of God. Standing in the crypt of the National Basilica, it was hard to miss the sense of being in the womb of the Church, the womb of the Bride of Christ, the womb of Mercy. I pondered the paradox of the God-man choosing to enter this world in an irregular and apparently scandalous situation, conceived before Joseph and Mary were living together as husband and wife, making Mary subject to stoning according to the demands of the law. Why that way, Lord? I have asked the question many times. I thought of Mary’s dilemma, about how difficult it must have been as she wondered how her situation would play out. I thought of all the months I worried about and prayed for Grace, asking God for his help that this situation, too, might play out well. Then came Grace, on the birthday of Pope Francis—the pope who baptized the baby of unwed parents on the Feast of the Baptism of Jesus. And here we now stood on the Feast of the Holy Family holding Grace hours before her baptism, with grace holding us. The last Gospel reading of the year proclaims: “From his fullness we have all received, grace upon grace; for the law was given through Moses, grace and truth came through Jesus Christ” (John 1:16-17, RSV). While the law was a teacher, grace is a healer. The law was a guide; but grace is a mother. The law foreshadowed Christ; grace gives us Christ. Grace welcomes Grace, making her a child of God “born not by natural generation or by human choice nor by a man’s decision but of God” (John 1:13). “Were sin the only thing that mattered, we would be the most desperate of creatures,” Pope Francis said in his opening homily for the Jubilee Year of Mercy. “But the promised triumph of Christ’s love enfolds everything in the Father’s mercy.” That enfolding comes in many forms—all destined to beckon us to God. I’ve watched an unborn baby call two confused young people to adulthood: to purpose, to promise, to love. I watch them now as they hold an infant daughter in their arms, presenting her to the Father of Mercies that she may be enfolded in his love. The law would have repudiated Mary. But grace embraces Grace, and her parents, with the medicine of mercy. The arms of severity have no place here, only the arms of love. 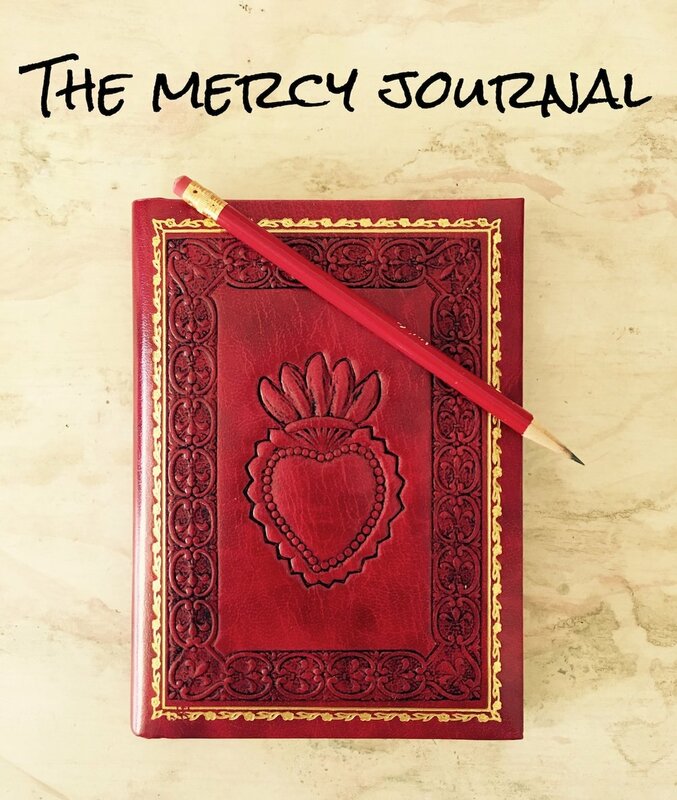 This post was previously published at Aleteia as The Mercy Journal. Happy birthday to our beautiful daughter, Kara, who has taught us all so much about love, and to our first grandson, James, who is such a gift of joy! Merry Christmas to you and your families! May the Lord grant you a fresh outpouring of mercy and love! At times, we are called to gaze even more attentively on mercy. Pope Francis, Misericordiae Vultus, par. 3. Our Christmas girl, who turns thirty today, wanted only one gift that year. “For my birthday and Christmas present, I’d like a plane ticket to bring Richard to visit our family for the holidays,” Kara requested with all of the innocent fervor of her kind eighteen-year-old heart. Richard was a middle-aged, legally blind man none of us had ever met. Living alone in Florida he’d heard Kara, a singer/songwriter, perform on EWTN’s “Life On the Rock.” He promptly found her website, and they formed a friendship centered upon letter writing and praying for each other’s needs. From what Richard shared, he loved the Lord deeply, and having no family, spent his days praying and watching Catholic television. “That sounds like a great thing to do for Christmas,” my late husband, Bernie, and I agreed, proud of our daughter’s magnanimity. Besides, having just buried Bernie’s thirty-six-year-old son unexpectedly in early September, we figured it would be a welcome distraction from our own intense pain. The next think I knew, we were picking Richard up at the airport. And while it seemed like a great idea in concept, I never thought about the possible repercussions of bringing a total stranger into our home until the man was upstairs, planted in a bedroom next to the ones where our five children lay sleeping. Downstairs in the master bedroom, I was suddenly seized with fear. “Bernie, we have no idea who this person is!” I elbowed my half-asleep husband. “He could be Jack the Ripper for all we know!” Thus began a sleepless night of listening to every drop of noise in the house, anxiously awaiting a sign that Richard had left his room. Daylight brought new perspective. As I sat down to coffee with the poor man, I realized he was probably much more frightened than I over the endeavor he just undertook—flying on a plane for the first time in his life to spend a week in an unfamiliar place with complete strangers. I soon learned that Richard had been blinded by the physical abuse of his parents, then sent to live in foster care while still a young child—only to land in the hands of another abusive mother. His life had been one of deprivation and suffering, and with no family whatsoever, he lived in poverty with two parakeets as his only companions. Though he'd worked for years as a gardener near his home, his physical infirmities eventually took over, sequestering him at home. Days passed, and what began to strike me about Richard was less the depth of his sad story than the immensity of his gratitude. He raved about how this was the best Christmas he’d ever had, and about how much love, warmth, and welcome he felt in our home. As I entered into Richard’s story, our own deep suffering began to feel much more bearable. It was then that I started to realize that to show "compassion" to another—which in Latin means “to suffer with”—strengthens and consoles us. “The crucified Christ has not removed suffering from the world. But through his Cross, he has changed men, opening their heart to their suffering sisters and brothers and thereby strengthening and purifying them all.” Joseph Ratzinger (Pope Emeritus Benedict XVI), The God of Jesus Christ: Meditations on the Triune God, 53. The grateful gaze of a blind man gave me sight that suffering Christmas, an unexpected gift of grace. What began as a token gesture of Christmas generosity ended in a purifying glance of mercy from heaven’s throne; fortifying us all. Author’s Note: This piece first appeared at Aleteia as "The Mercy Journal." Dear Friends, Happy Advent and Jubilee Year of Mercy! This is the first in a series of reflections I'll be writing for Aleteia to commemorate the Year of Mercy. Enjoy! Also, "Miracle Man" is ON SALE! Please order a copy today at the link to the right! It, too, is a wonderful story about the power of God's incredible, redeeming mercy. And so it begins. The Extraordinary Jubilee of Mercy—where the Church and the world will collectively ponder the face of God’s mercy, launching what Pope Francis has called “a tenderness revolution.” The year will culminate on November 20, 2016, the Solemnity of Christ the King, when “we will entrust the life of the Church, all humanity, and the entire cosmos to the Lordship of Christ.”* Wow. While many of us wring our hands about a world gone mad with hatred and violence, the Vicar of Christ on earth challenges us to contemplate “The Face of Mercy” that we may reclaim God’s mercy for ourselves and for the whole world. As pundits alarmingly warn us to arm ourselves, close our borders, and close ranks so we won’t be caught off guard by those who threaten us, Christ’s visible spokesman dares us to disarm ourselves with love, to open our hearts to compassion and forgiveness, and to “allow God to surprise us”* during what he insists is an extraordinary time of grace. In a world inundated with news of violence and escalating global conflict, many of us have come to dread surprises. Are we afraid to let God surprise us, too? And if we honestly reflect, what do we see when we contemplate the face of God? Do we see a Father who loves us relentlessly and passionately, who gazes at us with tender pity and reveals himself as “Abba,” “Papa,” “Daddy”? Or as Joseph Ratzinger (Pope Emeritus Benedict XVI) so pointedly posed the human dilemma, does God appear “as a menace...as the terrifying police guard who is inexorably bent on punishing us?”** For as Ratzinger insightfully concluded, how we view God has everything to do with how we respond to God. As I recently reflected in prayer on how I perceive God’s face, my memory was jarred by an experience I had in the confessional many years ago. Weeping profusely as I lamented my own wretchedness and the hot mess of my life, Fr. John—an elderly priest known for his immense holiness—cupped my face in his hands and gently kissed me multiple times on the face and forehead without saying a word, meeting my sorrow with the soft brush of his compassion. His fatherly pity pierced me to the core, and twenty years later, I still remember that encounter as one of the most profound I’ve ever had with the tender mercy of the living God. Outrageous, surprising mercy met my utter brokenness that day, revealing the face of God through the heart of a holy priest. Is this how we see God? As we begin the Jubilee Year of Mercy, it is fitting to ask ourselves: Will I let the heart of God penetrate my heart? Will I believe that God is mercy, not just theoretically, but for me? Do I trust that God’s love wants to meet me in my sin and brokenness to heal and transform me, and give me rest? May we cry with the blind men of Matthew’s Gospel: “Jesus, Son of David, have pity on us!” And may our eyes be opened that we may behold the merciful face of God. **Joseph Ratzinger, Pope Emeritus Benedict XVI, The God of Jesus Christ: Meditations on the Triune God, page 19.